Quality, uniqueness and place. Planning for quality of life. By Kevin Leyden and Patrick Collins. Ireland appears to be slowly re-emerging from its recent economic troubles and many have offered new ideas about our future. For us, this will involve considering the importance of two interconnected phenomena: the experiential economy and place-making. Both are about quality of life. We argue that focusing on quality will enable Ireland to compete internationally and more sustainably. Work carried out by the Whitaker Institute at NUI Galway has shown that – despite the recent economic malaise – goods and services that give consumers ‘an experience’ have seen their market share increase. Driven by sectors such as craft food, new media and gaming, worldwide exports of these products have increased exponentially over the last decade. Think of these as the goods that chime most with our consumer sentiment. Be they the latest release from the prime experience producer Apple in the form of a smart phone or the latest Nordic Noir boxset. Consider that well-designed and engineered smart phone: it is not the functionality per se that matters but the experience and ease of use. The best smart phones are beautiful in their functionality and therefore desired and purchased. They are individualised; they reflect the uniqueness of their user. The same goes for clothing, cars and baby buggies. Design and distinctiveness attract. Winners in the experience economy trade on uniqueness, quality, design, and on the symbolic nature of what they offer. If we think only about price we are catering only to a proportion of the market. Quality and authenticity sell too. Massification has given way to a mature consumer economy where we express our own unique identities through products and services in a way that could not be done in the past. We might consider the burgeoning Irish craft-beer industry. Surely – you would have thought – there was little room for yet another beer in the market place. But there was plenty of room for quality, uniqueness and a place-based experience. Even Ryanair – with its fixation on price – has come to realise that customers do care about the experience of travel, and how they are treated. Irish industrial policy and Irish entrepreneurs know most of this, of course. But sometimes we lose sight of the fact that uniqueness, quality and experience have value. We focus on decreasing price per unit to increase efficiency rather than increasing the quality per unit which can also lead to greater market returns. Far more needs to be invested in indigenous entrepreneurial talent and their production of quality, unique, place-based products. Irish clothing fashion, creative software and apps, gaming, music, the arts, literature, the hospitality sector, film and new media production among others need to be recognized and supported for their contribution to the economy. How and where we live, the day-to-day experience of place also matters. Quality urban planning contributes directly to our quality of life. By now there is solid evidence that urban design affects us physically, socially and mentally. Yes, planning decisions affect our weight (is walking to work realistic? ), our carbonfoot print, how we shop (on foot at local shops or by car at large multiples) and how social we are. A lot of it comes down to whether the place you live requires you to drive to attain your daily needs. Some planning models enable people to travel by multiple means – walking, cycling, or public transport – whereas others require the car. The choice of planning design matters; it has effects. Planning, building, and maintaining real places worth being in requires effort; it requires urban design, landscape architecture, and joined-up policy thinking. It requires multidisciplinary perspectives, creativity and an appreciation for uniqueness. We need to think far more about quality of life and additionally tapping the power of smart technology and the web to improve government services and urban liveability. Irish planners and engineers need to focus far more on place-making. That is, creating built environments that people are attracted to and enjoy being in. People want to live in well-designed, unique places that are beautiful. We want to live in authentic communities where we feel connected to each other. All suburbs or urban neighbourhoods should have their own style or sense of place. Each should be a unique destination. With some notable exceptions the Irish planning system offers the same suburban ‘cookie-cutter’ or mass-produced designs, and increasingly, the same monotonous shopping options via large multiples. Many of the suburbs outside the M50 look identical to those outside of Galway, or Limerick. This sameness is profitable for developers and Tesco but it is hardly profitable for people and their connections to the places they live. Many of the junctions and streetscapes follow the same appalling blandness. Quite often there is a total disregard for local context or the experience of the pedestrian. Quality urban design and place-making can have important economic effects too. Well-functioning – usually ‘walkable’ – places with unique shops, cafes, restaurants, pubs, and good schools, attract creative people and businesses. They make it easier for creative companies to attract and retain quality workers. Such vibrant places tend to be more social which can encourage the sharing of ideas which often leads to innovation and creativity. A lot of what has been behind the successful re-emergence of New York City has been place-making, preventing anti-social behaviour, promoting urban ‘liveability’ and de-emphasising the car. The attractiveness and design of place matter and are key elements of the experiential economy. 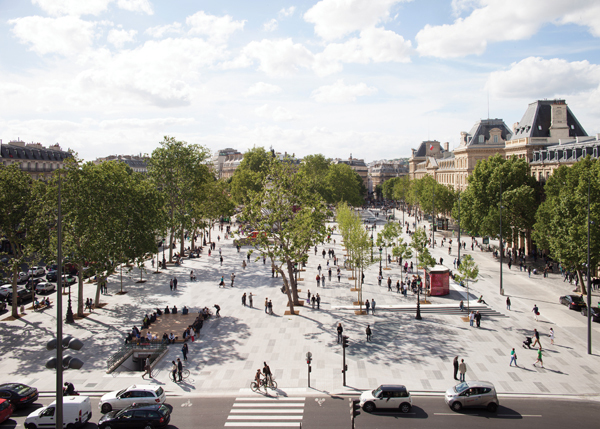 Indeed, place-making is all about creating experience and enabling them to happen daily. Dr Patrick Collins works in the School of Geography & Archaeology, NUI, Galway. Previous article Syriza seizes a moment for Europe.